Perhaps coincidentally, some of the same Thai and Japanese institutions which participated with Mr. LaRouche in 1983 and 1984 in international conferences in Bangkok promoting the Kra Canal, are now calling for a similar conference to be held in the near future, this time including Chinese interests. Despite the current extreme turmoil in Thailand, such efforts are precisely the basis upon which to bring peoples and nations together around the common interests of mankind. The current global strategic situation can be defined as a fight between two systems: a dying Trans-Atlantic system in its death throes, which seeks to destroy and loot a Eurasian system which has begun to commit itself to true principles of progress, outlined in this video Following upon the release of "Nuclear NAWAPA XXI: Gateway to the Fusion Economy," here we explore a case study featured in that report more in depth: the proposal to build a Kra Canal across Thailand, SEAWAPA project starting in Laos, two good candidates for construction using peaceful nuclear explosions. This is a real "Asia Pivot," typifying the concept of peace through development, contrary to the Obama Administration policy in the region. I do not have recent, explicit knowledge on China's interest in a canal through the Isthmus of Kra across the Thailand strip. From my active interest in this subject, during the course of the 1970-1980 interval, I do have specific, professional knowledge concerning the importance and feasibility of such undertaking, and its profound implications for the entirety of major neighboring regions such as, most prominently, China and India, but also the entire region of the China-India development process throughout the Pacific region generally. 1. Soon, the potential role of a well-developed Kra Canal must be among the presently best-known and most strategically important options in the underbelly of the Indian Ocean and closely related areas. 2. 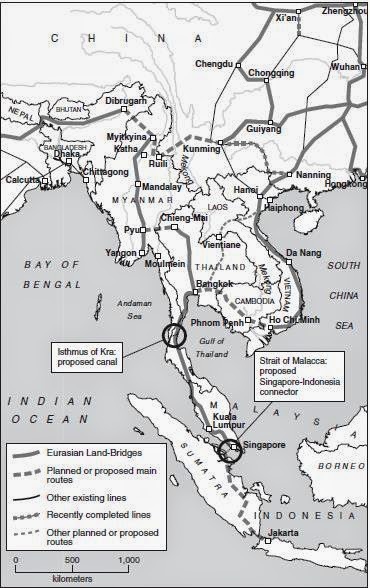 During a past period of my most excellent relations with Thailand, and of supporting actions pre-arranged, but disrupted between Thailand and Mitsubishi during that past time, the feasibility and rich benefits of the completion of the Kra Canal, were among the greatest potential benefits available throughout the region of the Western Pacific, and Indian Ocean waterways throughout all of Asia's coastal regions. I had enjoyed excellent practical relations with the nations immediately associated with that project at that time. 3. Until I was targeted for virtual political elimination, by British-imperial and Wall Street interests (on the issue of an SDI agreement between the Soviet government), until a pro-British interest gained access to the Soviet system's control, I had enjoyed often excellent cooperation with U.S. circles who had maintained close affinities with the tradition of President Franklin Roosevelt, as in opposition to enemies such as the infamous Dulles Brothers, who still tend to be represented by British-Empire-dominated interests, especially Wall Street branches of British imperial interests which have dominated the U.S. Presidency under the Bush-Cheney and Obama affinities to the British world empire today. The infamous "9-11" attack on the United States, which had been actually launched by Wall Street and British agencies through British-directed Saudi influences, remains a crucial strategic factor bearing on Asia's future presently, for this same reason. Under the consequent circumstances, my active connections to relevant circles in East Asia have since been greatly reduced, but, my broader strategic understanding of the East-South Asia region persists. Respecting your interest in the matter of the implications of a Kra Canal development, my broad strategic-economic competence remains relevant today. 4. Divide the maritime region of East and South Asia into three principal categories: China, a giant; India, a giant; and the maritime connection, throughout Southeast Asia's maritime regions, today. Add the impact of such triadic maritime and related connections, to the physical-economic relations to the Americas to the East, and the Middle East's underbelly and Africa. Then, the potency of a Kra Canal development appears not only as an eminently feasible feature, but a strategical political-economic force for the planet. That is sufficient to present the practical immediate, also, globally strategic considerations. (a) The studies of the Thai government and Mitsubishi have demonstrated both the economic feasibility and awesome benefits of the completion of the Kra project. The immediate prospect of difficulties, is predominantly political, and that itself, specifically British-imperial manipulations of governmental and financial-economic interests. On the U.S.A. side, the sources to be regarded as hostile can be traced to the history of the Dulles Brothers and the Bush-Cheney-Obama, British imperial-controlled regimes (e.g., Wall Street) in the United States still today. (b) From an engineering vantage-point, the project is probably the most feasible, most efficient, and relatively most beneficial measure for the entire underbelly of the Indian Ocean. The most common opposition to the Kra Canal, from within that region itself, is located precisely in Singapore. The chief source of resistance from Singapore, is entirely, global, British-imperial military-strategic interests. The completion of the Kra Canal, is not technologically difficult, if and when we take into account the massively beneficial impact of the creation of such a project; it would be principally the British imperial-strategic interests in the entire Indian-Ocean region, which has long remained the principal obstacle to the Kra during modern times. (c) The great boost to economic development of the South-Asia development, the massive economic advantage, and relative simplicity, of the undertaking, fulfillment, and exceptionally would be massive economic benefits such a canal represents for all of the nations of East and South Asia. There are two truly great nations in Asia: India, and the more populous China. The sheer volume of maritime trade between the two great nations of Asia, and their connections through the South Asia maritime regions, represents the potentially beneficial, and also efficient project for the entire region of the Pacific and Indian Ocean regions, and the co-development of the major regions of Planet Earth as a whole. Water is still the most economically efficient mode of economic transport among the regions of the planet. On Singapore as such, Singapore itself, when freed from British strategic imperatives, will benefit far more from the success of the Kra Canal development, than that development would ever bring without the development of the Kra! (d) The planet as a whole, is now entering both the feasibility, and indispensably leading role represented by a Helium-3 enhanced thermonuclear fusion, development program. Under such development of Helium-3, augmented developments of thermonuclear fusion modes, the access of mankind to control and exploitation of the immediate vicinity of the Earth orbit comes rather quickly to a mankind which inhabits Earth, but exerts increasingly efficient control over both the defense of Earth against menacing factors in the vicinity of the Earth orbit, and also the incorporation of the advantages from such developments for the development of human residence on Earth and also operations, on behalf of Earth, from nearby, and even, more distant objectives. It is the accelerated increase of mankind's power to act productively on, and for Earth, and that in the vicinity of Earth, which best serves the greater interest for all mankind, Singapore included.